transferred to the Pearl, which, together with the Shannon, was sent to India to form part of the Naval Brigade during the Indian Mutiny, for which services he received the thanks of both Houses of Parliament. He holds the Baltic and Crimean medal with clasps, and fifth class of the Medjidi, Chinese medal and clasp, and the Indian Mutiny medal. The Naval Brigade leaves a record of having fought twenty-four engagements with the rebels. He commenced yachting about 1880, his first boat being Netty. She was followed by Siola, a 20-rater. He then built Corsair, followed by Vendetta, Carina, and Rendez­vous, the latter a 29-ton cutter. 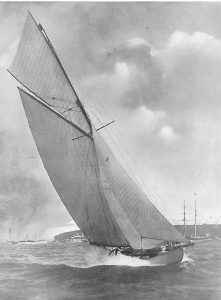 Carina was the first English yacht to race and win at Kiel. Resi­dence: 43, Rutland Gate, S.W.